Prize money at the 2013 BNP Paribas Open increased to US$5,030,402 following the ATP Board of Directors’ approval of Indian Wells’ proposed prize money distribution for 2013. Yippee! That means everyone will show up. The tournament is played in gorgeous surroundings but wind can be an issue, so players that can handle he conditions the best normally win out. The big dogs start finding their groove again this time of year, so expect some good matches to unfold. 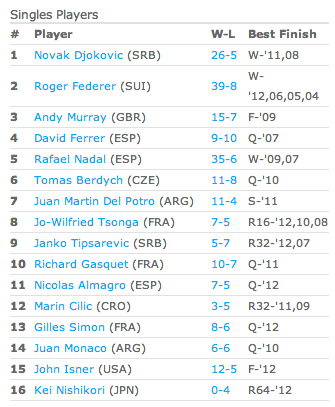 Djokovic, Ferrer, Nadal, Del Potro and Berdych are in form. Federer stalled against Berdych in Dubai to add to a worrying start to his season. Wildcards go to an entertaining bunch including veterans Robredo, Nalbandian and James Blake, along with US young bloods Tim Smyczek, Jack Sock and Steve Johnson. Defending Champion: Roger Federer – The Swiss Army Knife has been shaky the last few weeks, but he loves IW, so sure to shake off the rust. Nasty Floater: David ‘Nails’ Nalbandian – On account of his hard court record he’s my danger man, but struggles if taken to 3 sets. Veteran Watch: Tommy ‘Gun’ Haas – 34 and everything to play for. Lost in a final set tiebreak to Gulbis last week but playing well. Up and Coming: Jack Sock – Gets a wild card and with the right draw, could win a couple of rounds. Slumping: ‘Long’ John Isner – Surprise loss to Edouard Roger-Vasselin in Del Ray last week. On Fire: Novak Djokovic – Looked in devastating form last week in Dubai, but will be tested this week. My pick: Novak Djokovic – Although Murray, Federer and Nadal could win this, Nole is grooving on the hard stuff. Did You Know? In 2012 Roger Federer became the first player to claim four BNP Paribas Open titles, adding to the three straight he won from 2004-06.